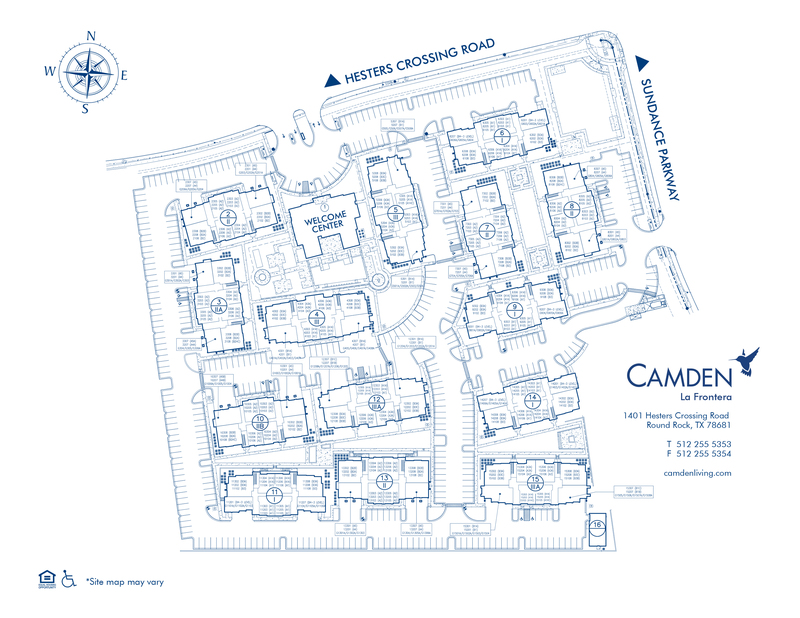 Camden La Frontera boasts one and two bedroom apartments and townhomes with attached garages located in Round Rock ISD in Round Rock, Texas. Our apartment homes feature wood plank flooring, granite countertops with dark and modern cabinetry, stainless steel appliances and garden bathtubs with tile surrounds. Every apartment home also includes a washer and dryer. Looking for a great place to hang out? Lounge by our beautiful swimming pool or relax by the fire pit. We also have an outdoor lounge area where you can enjoy a game of ping-pong or bocce ball. The perfect place to throw a party with friends is inside the resident lounge, complete with a flatscreen TV, poker tables, a demo kitchen and more. Need to change up your normal workout? Your apartment is just steps away from our fitness center and yoga studio. When you need a quiet place to get work done, our business center is there providing free Wi-Fi, comfortable seats, and a multi-functioning printer. Your furry friends will love it here too! We have a private dog park as well as a pet washing station. Take advantage of the popular shopping and dining at La Frontera Village, just minutes from your apartment home. Round Rock Premium Outlets is 10 minutes away and Flix Brewhouse is only a mile from your apartment. We are located just 15 miles from Lake Travis and 20 minutes from the popular nightlife of Downtown Austin. Residents receive a money-saving technology package included in the total monthly rent. This package includes AT&T high-speed internet and U-verse with over 300 digital video channels + DVR. Use the AT&T U-verse app on your smartphone or tablet to access your digital video anywhere! At Camden La Frontera, you can have it all. At Camden, your pets are family too! Come by the office for pet treats daily. We welcome cats and dogs, up to two pets per apartment home, with a full-grown maximum weight limit of 75 pounds each. Call us with any pet-related questions! Some apartment homes include garages and detached garages are available to rent for $125 per month.